Lol, ye but 144hp is better than 110hp from a diesasel, and it makes the right noise, even if it doesnt go! It feels more like 80hp at the moment tbh! I think i'll whip the carbs off on thursday and give them a clean out. If that doesnt help i'll pop the inlet off and see what the cam is like. Out of interest, whats the maximum safe RPM for this motor? if its making peak power at 5k then its presumably safe to rev it that high, but whats the limit? 5500? 6000? Deep in my Brain (maybe wrong) I seem to recall 8.13:1 discos reduced / restricted to 118 BHP ??? I'll tell her to stick to 5k then. Again no fancy electronic rev limiter to say "stop being a thwack!" I'm surprised the crank would give out at 5200 though. Modern engines tend to start chucking valvegear at 7k+ and rods soon after, cranks often go much much higher before causing problems! Although i guess a V8 is a little different to an I4. First off, given the history of this thing (if memory serves you pulled it out of a barn having been laid up for ages or something like that) it's no great surprise something's wrong with it. I doubt that it's a major mechanical failure as even a knackered V8 will run happily and pretty smoothly when totally f***ed as long as it has some kind of oil pressure. I suspect something along the lines of fuelling/ignition that's related to age or neglect - carp ignition bits, carbs in need of servicing or clogged up with debris / gummed up from bad old fuel, split vacuum pipe somewhere, linkage hanging off, that kind of thing, especially given your previous posts about how distributors and carbs work. An engine swap is certainly much more attractive than a rebuild if you go for a later 9.35:1 3.5 or 3.9 EFI, they're cheap, plentiful and have enough grunt for most. 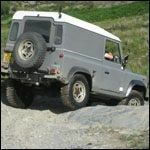 I doubt it would impact your insurance greatly unless they're total idiots, most would view swapping one LR engine for the same LR engine as a reasonable exchange if there's been no mechanical modification. Key words/phrases are "later equivalent replacement", "service exchange", "direct replacement", etc. rather than "Oh yes I've dropped a more powerful engine in" which immediately puts images of boy racers in their minds. Swapping the engine in a Range Rover for an almost identical engine from a Range Rover should be fine with any sane insurer, even if it's a slightly later model with a few more CC and fuel injection. Way back when, my insurers were fine with swapping the 2.6 I6 in the 109 (89bhp) with a 3.9 V8 (182bhp) because both were Land Rover engines, and it didn't increase the top speed (which is dictated by gearing more than anything). At 95K I would place money on a very stretched timing chain and a very worn cam ………….. probably very little lift on 5,7, 6, & 8 ……….. 7 will be the worst. 3.5 cams were the worst of the bunch for this sort of wear. The stretch in the timing chain will more than likely retard the cam timing by 4 or more degrees ………… The top end is first to go on the RV8 due the marginal oiling, but this engine hides it well as the hydro tappets keep it quiet. General lack of power is the trade mark of the above issues. High mileage engine failure is usually due to a broken chain on engines with 150K plus. A 3.9 cam will fit OK but it is more suited to EFI fuelling. Always replace lifters and cam together and never ever use a second hand cam. However, if the cam is worn then the rockers & shafts will also be well past their best. Bores may be OK but again I would suspect there to be significant ovality at that mileage (3 thou +), but that will depend upon the engine usage and how well it was looked after. You can f@rt about all you like with the timing and mixture , but if the cam & chain are worn there will be little improvement. Aye, it had been laid up a while when i first baught it. The ignition bits are all new (replaced by me) and seem to be decent quality, hence i'm looking at the carbs as prime suspect at the moment. I'll also look at replacing any fuel filters and suchlike that may be present. The fact that even though the original dizzy was completely gubbed, and even after i've replaced it with a working unit and replaced all the other ignition components theres no great difference in the performance, leads me to believe its either fuelling, or mechanically tired in some way. If it did come down to engine replacement time, i'd have to carefully weigh up the options as to whether to simply break this truck and buy another one. On a slightly different note, does anyone know if a carbed disco has an electric in tank fuel pump? If not, a) how does the fuel get to the engine on a carb model and b) would it be possible to stick an EFI pump inline with the normal carb feed line? Anyone done this before? Yes, it will have a low pressure tank pump ............. EFI models have a high pressure tank pump. You could leave that pump in situ as a lift pump and fit an inline high pressure pump when you change to EFI as EFI pumps tend to be good at pushing and poor at sucking. Suitable pumps can be found in old Vauxhalls, Fords, & BL. RV8 EFI is not very demanding pumpwise. I used a Ford pump from the XR4x4i ..... the 2.9 scorpio uses the same pump. The BL MG metro pump is also OK, as is the MG montego. Aye that was the plan, hence i hoped it had some sort of in tank pump to feed the EFI pump. A mate of mine has a few pumps laying around so i'll have a look at those to see if they can be adapted to do the job, otherwise, as you say i'll find an external unit from a ford/volvo/vauxhall etc. Thats a little while off yet anyway, first off i need to see if i can get it running any better on the carbs, and if not check the camshaft. I'll report my findings later in the week. You'll find that that the carburettor fuel pump will have insufficient flow to feed an injection pump inline. Circuit race cars would use something like a Facet red top pump to lift from the tank and feed a separate fuel swirl pot of about a litre from which the injection pump is fed. The return from the swirl pot to the main tank is restricted slightly so that in effect the swirl pot is always full. The return from the injectors and fuel rail feeds back to the swirl pot so almost irrespective of angle and main tank level there is always enough fuel. In your case you wouldn't need to try and fit an injection pump to the main tank. The Facet red top is quite a pricey pump though but flows well. Have you checked the fuel filter ? If as you say it's been laid up for a while there may be all sort of rust etc in the tank then on a long run the filter did it's job and got blocked. Also make sure TCC is really TDC (use a bit of welding wire down the spark plug hole not stick weld rod as the flux will flake off) also the original plastic timing gear wears and the chain stretches. Is it firing on all cylinders? choke stuck on a little? is there oil in the dashpots? air leak in manifold?are the compressions equal or close check them first and that might save a lot of time. Some Rangies had an external fuel pump, which is a Facet one anyway. Same as 6cyl & Stage 1 V8 Series 3. I'm going to check the filter and the carbs out later in the week. I've not checked TDC for accuracy, but i guess it cant hurt to check it. It SEEMS to be firing on all 8, but then not being used to a V8 motor its hard to tell. Afaik the "choke" on SU's simply pulls the throttle cable open, so even if it WAS stuck, it would just act like your pressing the accellerator a little all the time, rather than actually choking the carb down. No idea if theres oil in the dashpots, i've never looked. That will be part of my "carb rebuild check". Pretty sure on the SU's you will find that it operates a lever on the bottom of the carb, which pulls the bit where the needle in the SU sits down, to richen the mixture, as well as operating the throttle spindle. first port of call surely has to be getting the dizzy 100% right, then carbs and then cam. I'm no V8 expert but I would advise you to tackle one thing at a time and move around the system ensuring each component works right. The choke is another cable separate to the throttle . Are all the breathers( flame traps can cause a rich mixture) clear the ones on the cam covers & the one at the back of the engine? Do you have poppet valves in the throttle butterflies (more trouble than they are worth solder shut or get another butterfly)fuel drains fron the carbs can get blocked by mud underseal etc. Float level needle valve seals in float chamber you can take the dash pot damper pistons out and put in a length of wire in to the top where the piston was to see if both pistons are rising at the same time ie one not stuck.High oil pressure can hold tappets open not useually a prob on higher mileage but the bypas in the oil pump may be faulty or wrong spring put in by someone who thinks it will hide low oil pressure???? cant say much more without a crypton hooked up. Now that would be a good idea on line tuning. only try one thing at a time V8s hide power loses and tinkering very well because they are so forgiving .Standard ignition leads are pants get a decent set Magnecore are good. The dizzy is as good as its going to get. Mech advance and vac advance work and its timed up to 7deg btdc as per the spec on the rocker cover. The only possible issue is that the advance curve is a little more aggressive than the original dizzy because its from an EFI engine, however its not pinking, so i dont think its running too much advance. Bowie: Cheers. I've not looked too closely at the mechanism. Methinks you have much to learn. Oil in dashpots would be a very good start, if you haven't even got that far I would suggest that you sort ignition & carburation before worrying about anything to do with mechanical failure. Fridge: Even in my first post i said i was considering the carbs as the next step, i hadnt even considered the engine internals until people on this thread suggested it! Reading the Weber Rebuild manual again, i see where i got confused about the choke, the fast idle cam does pull the main throttle linkage round to open the throttle, but it also enrichens the mixture as well via some gubbins inside the carb. I do feel like tweaking these SU's is a bit like polishing a turd, but at the same time, i'd rather be sure the engine was working correctly before spending money on EFI bits for it, rather than fitting the EFI and find it still produces less power than a 1.0 corsa. I'll get the carbs cleaned out and setup as per the manual go from there. Agreed, SUs are one of the best design of carbs about (only IMHO ), sure EFI is better, but a well setup pair of SUs are pretty damn good. Nice and easy to work on and not to many fiddly little bits to loose when you strip it. Haven't played with one for about 15 years since I got rid of my last Mini. Jeebus, things must be pretty desperate then! As TSD has just pointed out, reading the weber carb manual is unlikely to help with understanding SU's.